True confession time: Two and a half months ago, I was out there defending my manager. Much of my defending was to one friend in particular—very baseball literate, despite being a Cubs fan. Somehow, she has assigned blame for the past 103 seasons of Northside Chicago Futility on the shoulders of one Johnnie B. Baker. In her eyes, he can do nothing right. But for me, Dusty was the guy that got the Reds in the playoffs in 2010, and that earned him a pass (or six) in my eyes on some questionable decisions in the first half of this season. Now the calendar has turned to September, and for the Redlegs it will not turn to October. So let’s partake in America’s REAL pastime: the blame game. Subject: Dusty. 1. Edinson Volquez—number one starter: The first evidence of Dusty’s poor evaluation of Volquez’s ability came last October when he handed him the ball for the first game of the playoffs. 1 2/3 innings later the Reds were down four runs and our half of the Josh Hamilton trade was taking a shower. Look, I hoped that this being Edinson’s last year before becoming a free agent might turn him into the Volquez of three years ago. But I am not with him every day. Dusty is. He should have seen signs that Volquez wasn’t ready. 2. Waiting too long to call up Cozart at shortstop: Despite Edgar Renteria displaying the range of a vending machine and Paul Janish desperately trying to rename the Mendoza line, he wouldn’t budge. By the time Cozart came up, the season was nearly lost. 3. The never-ending Fred Lewis experiment: As it turns out, just this week Fred was sent down to Louisville. Of course, the Bats’ season ends Monday so he will probably be right back up after that. But you tell me this: of the following options for starting left fielder for the Reds in 2012, which of them are you most certain will NOT be on the roster come spring: Alonso, Frazier, Heisey, Lewis, or Sappelt? You got it: The famous Mr. Fred. The same guy that had been getting the majority of starts before being sent to the minors. 4. Insisting on batting Drew Stubbs at leadoff: I get it. You desperately WANT Drew Stubbs and his ridiculous speed to work. Problem is, he is a mere 20 strikeouts from reaching 200 on the season. Speed only works when the ball is put in play and you reach base. Things got better when Brandon Phillips moved to the top of the order, but only when DatDude went to Dusty and requested the move. And it’s not like this is a crazy idea. Phillips led off 72 times last year. Their record when he led off? 43-29. 5. Calling up Yonder Alonso and then NOT PLAYING HIM: It is well documented that Alonso will never be mistaken for Ozzie with the glove. His most natural position is currently being occupied by the reigning MVP. But no one has claimed ownership of left field (which was his primary position in Louisville before getting called up), and Yonder professes to be more comfortable at the hot corner than anywhere else. So what has Dusty done? Given him a handful of turns in left field and exactly ONE game at third base. And why, pray tell, did he allow him that one game? Because he DIDN’T THINK ALONSO WOULD GET MANY BALLS HIT TO HIM! Wow. What a perfect strategy to try him out to see how he does. Granted, there were a lot of other problems with this season that were out of Dusty’s control: sub-par performances by Arroyo and Wood, an occasional shaky bullpen and (most significant) the injury to Scott Rolen. But many issues could have been avoided. So, Dusty: I forgive you for 2011. But I am expecting a title in 2012. As I told you guys the first week I posted about the Reds, they were truly my first love. And lovin’ was easy those early years, as they coincided with the seasons of 1975 and 1976. Now, of course, not every season could be like those. And over the years I’ve come to accept the fact that, by and large, most Reds seasons will end in disappointment. Such is life when your team doesn’t have the payrolls of the Yankees, Red Sox or Phillies. But then the division championship came out of nowhere last year and I fell in love all over again. Life was wonderful again. With a young and exciting roster, this was the start of an era to rival the mid-70s. I loved the Reds, and it was clear from their winning ways that they loved me back. The trade deadline is less than 72 hours away, and there are more opinions on whether the Reds should make a major move than Phyllis Diller got rhymes. Some say the Reds should stay put and see if their young players (Cozart, Alonso and Heisey) can give them the spark they need. Those wanting to deal are torn between landing another starting pitcher, a reliever, or a solid bat to stick in the middle of the lineup. As for me, I think they need to make a deal, but the deal should be with a player already on their roster. 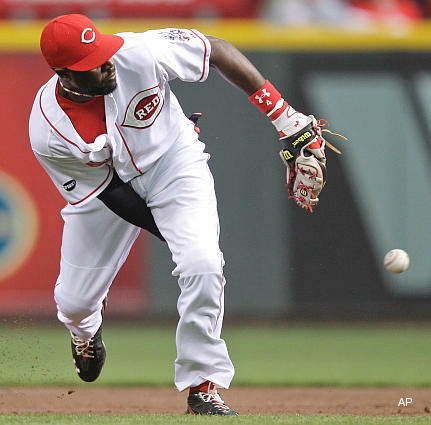 The Reds need to sign Brandon Phillips to a long-term contract. I know what you’re thinking: What’s the rush? 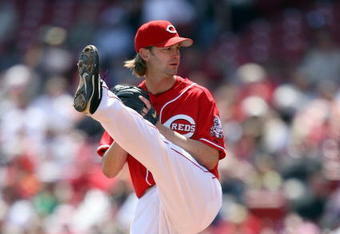 The Reds have him signed through the end of the season, and have an option to sign him in 2012 for $12 million. But I think signing him now, in the middle of what has been a less than stellar season for the club, sends the right message about the Reds’ intentions for the next few seasons. Let’s face it: if the Reds let Phillips go after 2012, whoever takes his spot at second will represent a drop off in defense–no matter who he might be. Phillips is the best defensive second baseman in the league, and there is no question he is the best Reds player at that position since Hall of Famer Joe Morgan. I grew up watching Morgan play, and I don’t recall him having the range or arm strength of Phillips. At least with the glove, he is a once in a generation player. Offensively, he’s not Joe Morgan. But among all second basemen today, he ranks third in RBI, sixth in batting average, ninth in homers and OBP, and tenth in slugging and OPS. Those stats are pretty good, but I have a feeling we haven’t seen the best of him yet. BP is 31-the age Barry Larkin was when he had his MVP season. I think Phillips is going to have one of those magical seasons when everything just clicks for him and he will be a MVP candidate. I only hope he’s wearing a Reds uniform when it happens. But aside from all that, Brandon Phillips is the face of the Cincinnati Reds. Yes, I know. He drives us nuts sometimes. We wish he hadn’t publicly called the Cardinals a bunch of WLBs (even though THEY ARE) and sometimes he seems a little too casual on the field. @DatDudeBP has the greatest smile in the game and (largely through twitter) has developed a relationship with his fans like nothing we have ever seen. He’s cracking jokes with the haters in St. Louis and flying his #BP FansShawty out to hang with him on road trips. He’s showing up at a kid’s youth league game. And (quite important in this day and age) he doesn’t appear to be destined for scandal. Word is the only alcohol that has ever touched his lips was a sip of celebratory champagne after winning the division last season. I grew up with an appreciation for a specific Reds trade as a crucial component in forming the Big Red Machine. In November 1971, the Reds sent Lee May, Jimmy Stewart and Tommy Helms to Houston for Ed Armbrister, Denis Menke, Cesar Geronimo, Jack Billingham and Joe Morgan. Armbrister was a decent pinch hitter. Menke was later traded for Pat Darcy, who went 11-5 for the Reds in 1975. Geronimo won four gold gloves in centerfield. Billingham averaged 12.5 wins in six seasons for the Reds. And I seem to recall the aforementioned Morgan guy ended up alright. It’s still the greatest trade in Reds history, but another that has to rank right up there is the one they made in 2006 with the Indians. Phillips came to the Reds for nothing more than a “player to be named later.” That player, Jeff Stevens, has logged a grand total of 7 innings pitching for the Cubs this season. Following a third consecutive loss to the Mets at home, the Reds’ season may quickly be fading away. And that’s why it’s time to make another great deal. It’s time to give DatDude a long-term contract. The Reds are, very likely, done for 2011. Yes, I know they are a mere 4 games out in the standings. Yes, I know the Reds brass have (finally) given Zack Cozart a chance to show his stuff at the big league level. And, yes, I know there are two and a half months of baseball remaining to be played. But the numbers just don’t stack up in the Reds’ favor. Before the season started, I figured the magic number of wins to reach the postseason would be 92. To reach this number in the remaining 70 games, the Reds would need to win at a clip of .671. The best team in baseball (Philadelphia) has a winning percentage of .626. Not even the Big Red Machine of 1975 won games at this rate. Of course, it isn’t like anyone else in the Central Division is setting the world on fire, so in reality 92 wins may not be necessary. But the Reds will have to win at the Phillies’ current pace in the second half to even get to 89 wins. Again, a difficult task. But let’s TRY to sprinkle a little positivity into the conversation. A facebook friend (who seemingly loves the Reds and loves math equally) shared some interesting information. Using something called “pythagorean expectation,” (approximately 23 heads just exploded) he calculated the “expected records” for the Reds, Brewers, Cardinals, and Pirates based on actual runs scored, runs allowed and other “mathy” stuff. The bottom line: the Reds are first among these teams in “expected wins,” yet last among them in actual wins. While there are many variables involved in baseball, and it certainly isn’t math in its purest sense, if the second half allows any sort of “correction,” the Reds could find themselves back in the hunt even if they don’t actually hit or pitch any better than they did in the first half. Perhaps they have only been the victims of some bad luck. So, for the moment, let’s consider the possibility that the Reds will get back in the hunt in the second half. Here’s what I think will have to happen. 1. Even the score against the Pirates. Yes, the Bucs somehow have a better record than the Reds at the break. But a 6-1 record against the Reds this season is a little out of whack. The Reds have 9 games against them in the second half, and will need to win at least six of them to return things to normal. 2. Beat the weak links. Unfortunately, the Reds only face three teams (the Cubs, Astros and Padres) that have winning percentages below .450 the rest of the way. Fortunately, there are sixteen games remaining against them, but they won’t get anywhere just winning 10 or 11 of them. They will need to get fat against these teams. 3. Win games in bunches. In the first half, they had two five game winning streaks and two three game winning streaks. They will need at least one run of something like 11 of 13 to make up some ground in a hurry. It’s not likely that they can grind out a winning percentage over .620 just by winning six (and occasionally seven) out of every ten. 3. Jay Bruce needs to be Jay Bruce. He doesn’t need to be “NL Player of the Month Bruce” as he was in May, batting .340 with 12 homers and 33 RBI. He just can’t be the “NL Stinker of the Month Bruce” as he was in April and June, averaging .220, 3 and 9. Somewhere in the middle (.280, 8 and 20) in each of the remaining months will suffice. There are other things I’d like to see (such as Drew Stubbs putting the ball in play more often, Jonny Gomes getting crazy hot, and Edinson Volquez never donning a Reds uniform again), but if they can accomplish these things they have a chance of getting back into the thick of things. If not, well, I’ll see you at the goalposts after the Cats beat Florida AND Tennessee this season. Technically, I pronounced the season dead after Tuesday night’s loss, but in actuality I had a very uneasy feeling when the Reds couldn’t manage to push across a couple of runs to beat Chris Crypenter with Cueto’s gem on Independence Day. They were faced with having to rely on Volquez and Arroyo to find a win for them. For those that don’t like surprises, Volquez did not disappoint. He gave up three homers, put the Reds in an early hole, and assured the Cardinals a series win. So all hopes for a win in St. Louis would rest on the arm of Bronson Arroyo, which has lately resembled a machine at the batting cage set to “little league” velocity. The Reds even held Dontrelle Willis out of a start in Louisville because they didn’t think Arroyo would be physically able to pitch. But, once again, Bronson showed some unbelievable toughness and was lights out for five innings and left with the game still well in hand. And then it all fell apart. The once 8-0 lead became 8-5, then 8-7, and a rare blown save by CoCo sent them game to extras. I turned the game off and on so much the neighbors probably thought I had a strobe light installed in my bedroom. Thankfully, Ramon Hernandez played hero again and Chapman (really?) came in and blew the Cards away in the 13th to secure victory. So, of course, they have sucked me back in. Wednesday’s game was somewhat a microcosm of the Reds’ season. They showed signs of the superior offense we expected. They had timely hits. Arroyo pitched great as a starter, and Chapman was dominant as a closer. But along the way they lost their focus and blew an EIGHT RUN LEAD. At various points of this season, the offense has produced, the starting pitchers have put together a string of quality starts, and the relievers have dominated. But it doesn’t seem like this has ever happened at once. The Reds are like my golf game: once I get my drive figured out, I lose my short game. And once I figure out my short game, I can’t putt. A couple of other random lineup observations: First, I think Edgar Renteria came to Dusty and said “I’m not producing because I’m not playing enough. Make me the primary shortstop through the All-Star break and let me show you what I can do.” So far, the results have not been good. In six games of July, Renteria is batting .167. He will need a big series against the Brewers to convince Dusty to keep him in the lineup. BREAKING NEWS: Zack Cozart is in Milwaukee. Looks like Dusty has all the information he needs to decide what to do with Renteria. Second, it looks like the outfield of choice features Lewis in left and Heisey in center. Though it represents a defensive drop-off at both positions (yes, Fred Lewis is actually WORSE than Jonny Gomes) it does represent a bit more offensive consistency. I have been a Fred Lewis doubter all season long. But the guy has hit over .300 in the last eight games, so it seems to make sense to keep him in there. So here we are. A four game series in Milwaukee began Thursday with a Reds loss 5-4 to the Brewers, if they can manage 3 of 4 in the series (not far-fetched, as Bailey, Leake and Cueto will take the mound for three of them) they will somehow still be in the race at the break. The Cards, Brewers and Pirates (really?) are as much to blame for this as anyone. By my math, Cincinnati should be at least five games out of the lead. The margin is only three. The Brewers series is HUGE. By Sunday, we should have a good feeling of whether the Reds will be buyers or sellers before the trade deadline. The Reds need a shortstop. The Reds need a leftfielder. The Reds need a third baseman. The Reds need another starting pitcher. Throughout the first half of the season, at one time or another, every one of these wishes have been uttered by Reds fans. Chances are, there are a good number of Reds fans crying out for all of these things right now. While I have no knowledge of whether P-Pat has any baseball skills (though I think we can all be certain that he could throw out a better first pitch than John Wall), there is no doubt that he was a model of consistency throughout his Wildcat career. Every Single Night you could write it down that he was going to get double digit points and around eight rebounds. He didn’t get his career averages of 16.5 and 8 by going off for 30 and 15 one night and then struggling for 4 and 2 the next. You knew what you were getting from Patterson every game. Outside of King Votto and (to a lesser extent) Ramon Hernandez, the Reds simply don’t have anyone that provides this level of consistency. (Well, other than the shortstop platoon ofJanish/Renteria, and that ain’t the good kind of consistency.) Look no further than NL Player of the Month Jay Bruce. He batted .342 with 12 HRs and 33 RBI in the second month of the season. In April he was .228, 4 and 11, and he wrapped up June with .217, 2 and 7. It all averages out to .270, 18 and 51. Solid numbers, but the truth of the matter is for two thirds of the season he has played well below this standard. Jonny Gomes is hitting .320 this month. Problem is, his other months have been so horrible his batting average on the season is .225. Even Brandon Phillips, in the middle of what may be a career year, batted 100 points lower in May than he did in the other two months. And while Rolen and Stubbs have maintained consistent batting averages throughout the season, neither have provided day in and day out what the Reds really need from them: power from Rolen and on-base percentage from Stubbs. The Reds season has so far been a roller coaster because too many of the Reds players have been roller coasters. Nonetheless, they showed some signs of life by taking 2 of 3 from the Rays, and they need to do the same against the Tribe this weekend in Cincy. If they can do that, they can control their destiny into the All-Star break with three against the Cardinals and four against the Brewers. The Reds are a little more than halfway through this crucial stretch of 35 games leading into the All-Star break, and by my math they have whittled a couple of games off their win deficiency in relation to playoff pace. I wasn’t counting on them winning more than one game from the Yankees, but I am definitely counting on them to get fat on some fried Oriole this weekend. While having the Yankees on the schedule doesn’t make things any easier, getting on the same field as the standard of excellence in your sport provides a great opportunity to see where you really are. And, as far as I’m concerned, three things we all suspected became very apparent during this series. Johnny Cueto is an ace. He got a late start this season, but since his return on May 8 he has been ridiculously good. He has the lowest ERA in the National League among pitchers with at least 60 innings pitched, and in his last five games he has gone seven innings four times, eight innings once, and has given up a grand total of five runs. I want to Shout It Out Loud that Johnny should be an All-Star. When the Reds need him the most, or when he’s facing a top-tier opponent, he rises to the occasion and becomes a Strutter. At a mere 25 years of age, he is definitely a Flaming Youth, and batters leave the box usually with the sensation of Sweet Pain. Okay. Sorry for all the Kiss references. But you get my point: he is goooooood. It’s time to make a change at the shortstop position. We get it Dusty. You’re a “player’s manager.” You want to stick with veterans long enough to allow them to work through their problems. But nearly halfway through the season Janish and Renteria are hitting under .230 combined, and they have already committed 15 errors. At that pace, that’s more than 30 over the course of a season. And no, Jose Reyes isn’t walking through that door. But Zack Cozart could. He’s batting .320 in Louisville and playing solid defense. Granted, it’s Triple-A and not the majors. But we’re talking 90 points difference in batting average. Why not give him a shot? There are some dilemmas in the outfield. Heisey was an absolute beast last night. And while one big night does not a season make, I think hitting three homers from the leadoff spot against the Yankees to stop a two-game skid is a good indicator that this kid has star potential. Meanwhile, Gomes is starting to come around again, while the guy that has led off the entire season is daily padding his MAJOR LEAGUE LEAD in strikeouts. Why, oh why, does Drew Stubbs not use his blazing speed? As a leadoff man, your job is simple: Get. On. Base. As for Fred Lewis, buh-bye. You are of no use to me. You can’t hit, and you seem incredibly uncomfortable fielding your position. But let’s remain positive. Last night’s performance by Heisey earned him a “Klondike Moment of Glory” on the MLB website. Which begs the obvious question: No, not “what would you do-ooh-ooh for a Klondike bar.” These questions: Has anyone ever actually eaten a Klondike bar? (I have never had one. I’ve never seen anyone ever have one.) If no one’s eating them, why do they think we would do ridiculous things to get one? Why don’t you instead ask me what I’d do to get a Graeter’s back into Lexington? So far, so good. The Reds are now nine games into their crucial stretch of 35 leading into the All-Star break, and their record stands at 6-3. As I mentioned last week, if they are going to make a move to get back into the race, now is The Time. It’s also summertime, and that means your excuses for not driving up to see the Redlegs have greatly diminished. The kids are out of school, it gets darker later, and television is AWFUL. But this week I want to focus on perhaps the best reason to get to Great American Ballpark: The Food. Last week, Pedigo brought to our attention that some website called “Man Tested Recipes” has named the Meat Lover’s Hot Dog in Cincinnati as the best new food at a ballpark in 2011. Now I know some of you out there hear “hot dog, bacon, fried, salami, chili, cheese” and get all food-nutrition-snobby. You are also the people that ruined McDonald’s by getting them to clutter up their menu with yogurt parfaits and apples in a Happy Meal. (It’s a “Happy” Meal, people! Not a “Guilt-Ridden, Overly Obsessive, Count Your Calories” Meal!) To you I say, get over it. Americans overindulge. Baseball is America’s Pastime. Do the math. 5. Montgomery Inn Barbecue: True confession: I don’t really like Montgomery Inn Barbecue, but I know a lot of people really, really do. While I figure those people obviously have never been to Tuscaloosa, Columbia or Owensboro, I do appreciate the existence of this local favorite inside the ballpark. You can find it near Section 127. 4. Funnel Fries. Take the glory of a funnel cake and add the convenience found in the form of a french fry. How can you go wrong? These (along with garlic fries and cheese fries) are sold at Game Time Grill, with four locations inside GABP. 3. Penn Station. Suffice to say, my wife and daughter are not the Reds fans that my son and I are. But knowing that there is a Penn Station in the ballpark can coerce them to a game or two each season. The only downside is that there is only one variety available (the Philly Cheesesteak, and I’m more of a Chicken Teriyaki sort of guy), but the quality of the sandwich and the fries is comparable to what you find at your local Penn Station. It is found near sections 130 and 154. 2. Skyline Cheese Coneys. For me, the cheese coney is as emblematic of Cincinnati as the Big Red Machine itself. I really hope there’s no one out there that has never experienced the majesty of the cheese coney. Sometimes I catch myself singing this song if I haven’t had one in a while. Five locations throughout the stadium. And #1, the GOETTA DOG. I didn’t grow up in Cincy or northern Kentucky, so I am a newcomer to goetta. But I have had it in hot dog form at GABP and in its original form at the world famous Anchor Grill in Covington, and I am hooked. For those still wondering what the heck I’m talking about, goetta is basically a sausage made from ground meat and oats. I know what you’re thinking, but ya gotta trust me on this one. My son is convinced there is no better dog in the world than a goetta, and he’s the kid that was only short a Polish from hitting for the “sausage cycle” at Miller Park a couple of summers ago. Get a Goetta. You can find them at Roebling Dogs near section 112 and sections 130-132. Those are my favorites. Let me know what yours are. There’s also a new Mr. Reds’ Smokehouse down the right field line that is supposed to be all that. So pack up the kids and the antacids and get to a Reds game this summer. The TailgateReview crew and all of it’s readers from coast to coast and around the world, wish Coach Larry Allison and the 10th Region Champs, the George Rogers Clark Cardinals the best of luck tonight in the first round of the 2011 Kentucky National Insurance/KHSAA State Baseball Tournament! The Cards will make their first appearance in the expanded 16-team formatted state tournament tonight against Central Hardin at Whitaker Bank Park. The first pitch is slated for 8:30 p.m.
Keith Taylor of The Winchester Sun has the GRC line-up projected to look like this tonight, Pokey Harris (.350), Tyler Cain (.357), Logan McQuerry (.476), T.K. Korb (.491), Zach Pasley (.464), Jake Robin (.339), Brent Stoneking (.295) and Robert Hatler (.281). The tournament got kicked-off this morning and will continue all day long. Good luck to all of the great baseball teams from across the bluegrass state in the state tourney. The 16 team field consists of Warren East, Letcher County Central, St. Xavier, Clay County, Mayfield, Apollo, Central Hardin, George Rogers Clark, Union County, North Oldham, Boyd County, Mercer County, Pleasure Ridge Park, Lexington Catholic, Newport Central Catholic, and Lawrence County. Hit’em where they ain’t boys! Back in April and May, when it never seemed to stop raining for more than 4 minutes, I selfishly stayed in a bad mood because I was damned to the indoors. I never took in consideration the plight of the many baseball teams in the area who were unable to get on the fields they so love. One of those teams was the George Rogers Clark Cardinals, my alma mater. I once roamed the Cardinal Field grounds as a confused teenaged boy and I completely understand the frustration that goes with rain-outs. A 22-11 record does not seem “state tourney” worthy, but when you consider GRC played a grand total of 5 home games this season, it is a little easier to swallow double-digit losses. The cards played 4 home games in the month of March and only one more home game for the remainder of the season. If you are wondering, yes, that is crazy. After the Cards lost to the Bourbon County Colonels, 10-4, in the title game of the 40th District tournament, GRC has taken off! Larry Allison and his squad of redbirds headed to Campbell County for the 10th Region Tournament last week and came away with wins over mason County (8-1), Campbell County (6-5), and a huge revenge win over Bourbon County in the championship game (14-4) in 5 innings. The win sends GRC to the Kentucky National Insurance/KHSAA State Baseball Tournament. It is Clark County’s first appearance in the state tournament since the format changed from a three-game semi-state series followed by an 8 team tournament to it’s current 16 team format, similar to the one used in the Sweet 16 basketball tournaments. On Monday, June 13, at 8:30 p.m. from the home of the Lexington Legends, Whitaker Bank Park, George Rogers Clark will begin their journey to the state championship. They will face Coach Todd Thompson and the 5th Region champs, the Central Hardin Bruins (32-4). I have a feeling Malik Warner, Anthony Withrow, Tyler Martinez, Scotty Turner, Justin Harris, Taylor Norton, Jake Robin, Christian Cooke, Nicholas Hyslop, Zach Roe, Mason Hisle, Skylar True, Hunter Staton, Matt Williams, Logan McQuerry, Taylor Howard, Zack Allen, Billy Hatmaker, Zach Pasley, Justin Maggard, Justin Carrus, Brent Stoneking, Dustin Bonner, Taylor Evans, Jesse Bates, Derek McKenzie, Tyler Cain, Ryan Frye, Darius Skinner, Steven Davis, Wes Lawwill, Aaron Parrish, Robert Hatler, Justin Howard, Zach Martinez, Hunter Osborne, and Trevor Back might have a little something for the filthy Bruins Monday night! Good luck to Coach Allison and all of the guys on Monday! If you are not paying attention, Clark County is dominating 10th Region athletics right now! State Bound! C! A! R! D! S!